The sense of history in the making was palpable Monday in Krakow, Poland, where more than 20 staff members of USC Shoah Foundation — The Institute for Visual History and Education attended a reception to honor more than 100 Auschwitz survivors on the eve of the 70th anniversary of the liberation of the death camp. Also on hand were institute founder Steven Spielberg and other dignitaries, who thanked the aging survivors for their courage and commitment to sharing their stories. The event was part a four-day observance of the Jan. 27 anniversary called Auschwitz: The Past is Present, a global communications and education program in support of the official anniversary commemoration at the Auschwitz-Birkenau State Museum. USC Shoah Foundation and the World Jewish Congress spent months locating and arranging travel for the aging survivors, many of whom are likely making the trip for the last time. To be able to come back and retell this story of the Holocaust is a way of illuminating the world, a way of healing and a way of empowering people to repair the world. The Monday gathering happened on the eve of today’s official anniversary at the infamous Death Gate to the 472-acre camp, where 1.1 million – most of them Jews – were killed between 1942 and late 1944. The event was bookended by two historic photo shoots. The first was a reunion shot of four Auschwitz survivors who were among 13 children depicted in an iconic image standing behind the barbed wire shortly after liberation by the Soviet army. 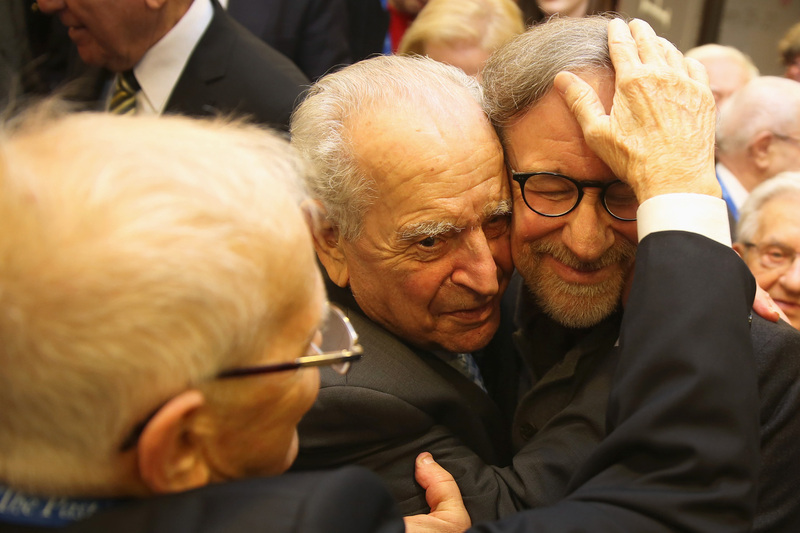 The second was a photograph of the 100-plus survivors surrounding Spielberg, who established the institute in 1994 after making the Academy Award-winning Schindler’s List. The movie is widely considered one of the definitive films on the Holocaust. In addition to Spielberg, speakers included David Zaslav, CEO of Discovery Communications, which partnered with the institute to bring students and teachers from around to Poland for four days of professional development and education. Also speaking was Jacek Kastelaniec, general director of the Auschwitz-Birkenau Foundation, who announced that the museum would be preserved in perpetuity thanks to $120 million donated by multiple benefactors and several nations. Germany alone donated funds covering more than half the project’s cost. In his comments, Kastelaniec alluded to a plan to bring to Auschwitz-Birkenau State Museum the USC Shoah Foundation’s complete Visual History Archive, which contains 52,000 video testimonies of survivors and witnesses of the Holocaust and other genocides. Those testimonies could be in danger because of the force of denial by the people who are trying to say that the Holocaust never happened. “(The archive is) the most important educational tool and most important thing for the future generations,” he said. Musical interludes included a specially themed piano duet composed and performed by USC students Alex Biniaz-Harris and Ambrose Soehn. Biniaz-Harris is the grandson of Celina Biniaz, an Auschwitz survivor who was the youngest female selected to work in Oskar Schindler’s lifesaving factory. Spielberg stressed how the importance of remembrance and combatting intolerance has taken on added urgency in the present day. Anti-Semites, radical extremists and religious fanatics … want to all over again strip you of your past, of your story and of your identity.